Just a referral isn't enough. Time to ring the sleep doc, drop off your SD card for review and ask for an urgent appointment. Or at the least be put on the cancellation list. Whatever it is, it needs to be looked at ASAP. My problem is my sleep Dr is 250k away in Canberra. I feel good in the day went for my half hour walk this morning -2 C had me going a bit faster then normal at 5.2km/h. First of all: I'm from germany ... so this might sound awkward or funny phrased at least - my active vocabulary in english is a lot smaller than my passive vocabulary. So, some things might get lost in translation .. maybe if someone understands what I'm trying to say can jump in and put it in proper words. (07-06-2017, 02:37 PM)dwd1249 Wrote: When I woke my right nostril was completely blocked and left one stuffy . This is not unusual for me. That would explain to me what we see in your "breathing pattern". I would really advise you to see a doctor - a pulmonary specialist or an ENT might be in order too. Shortly after I went to bed last night I felt the need to use a handkerchief / clear my nose. .. thought of you and decided to wait a few more minutes. I'm using a FFM and I have "hay fever" or allergic rhinitis, so what your are describing is nothing new to me. (that's why I'm using a FFM) And please keep in mind that I was still awake during the following. The fact that we don't see much mouth-breathing on your charts makes me wonder a little bit. I would assume you (still) get enough air. the only problem is: your machine can't make anything out of it. I would go even one step further and say: without the positive pressure your nose would block completely and you would start mouth-breathing. 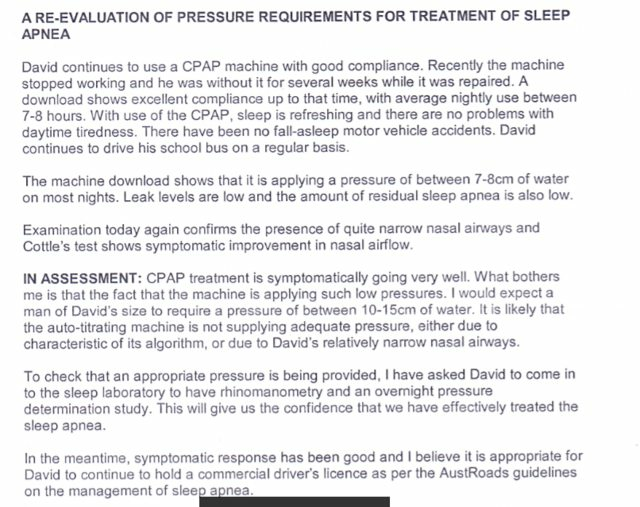 The only problem I see here is: I'm not convinced that the machine delivers the right pressure for your obstructive sleep-apnea. With a nasal mask you now have the problem that the machine is "seeing" 2 kinds of obstructions: the one from your stuffe nose / secretion and the "real" obstructions (collapsed airways) from your OSA - both overlapping. If you do this "double inhale" thingy your breaths are really short and the machine cannot tell if there are flowlimitations or not - If the machine would know, that it is not looking on 2 inhales but one single really distorted one it would flag it as a bad flowlimitation / partial obstruction and raise the pressure. Hypopnea detection is mostly impossible, because the tidal-volume seen by the machine is not your "real" tidal volume - thus hypopneas can no longer be correctly flagged. If you have the chance to use a FFM - really give it a try and start mouth-breathing with it. In the meantime I would give CPAP some considerations. Your overall pressure is pretty high - you somehow feel "refreshed" in the morning - so I would say: therapy is still working. If the pattern from the last nights is always the same, I would prognosticate that as follows: you go to bed with the lower pressure of 8 ... your nose starts to get blocked ... the machine raises the pressure (which somehow keeps the "secretion" out of the way) .. you still get enough air and not start to mouth-breath. Maybe - just maybe - this blocking of the nose can be avoided or postponed if you start with a higher pressure? As your machine cannot make out if you inhale or exhale or what is going on, it makes not much sense to put it on auto. - but I might be totally mistaken there. Maybe raising the pressure some more in the night really is helping and avoids mouth-breathing. - but than: why not just raise the pressure right from the start? But that should only be really short-term until you get your nose under control^^ - Do something against that - if you want to stay on nasal masks. Just my 2 cents on what we saw. Thanks for your replies. I had no problem following your post. I never attempt a post as long as yours as my spelling is so bad that when spell check gives me options, sometimes the right one isn't there. Other times I have to Google it to make sure it's right. My sleep Dr said that I had narrow nasal passages and my old Resmart wasn't providing high enough pressure in apap for a person my size, so he put me on a fixed cpap of 14. When I got my Resmed A10 December 3 2015 I started using apap. The Resmart machine had a fault and wouldn't boot up. I'll try to post the report tomorrow. you didn't say much about your nose - or why it is, it is "stuffy". In case you have something like allergic rhinitis or "hay fever" (I'm not sure if this translates correctly) what helps me a lot is "dymista" ... breathly checked and it seems it is available in australia as well .. in germany it should also be a "over the counter medicine" ... never checked as I get that prescribed. I would not advise to use that on a daily basis without seeing a doctor and not more than twice a day. EPR is not and probably never was helping you, as the machine couldn't figure out if you inhaled or exhaled ... so the pressure itself shouldn't be a problem. I would skip any ramp and start directly with that pressure - or choose a very short ramp of 5 minutes or so. If your nose gets stuffed up with secretion you should indeed breath more shallow. Which is nothing more than flow-speed (and to some degree tidal volume). If you breath in deep (or fast) the flowspeed increases - not so easy with a stuffed up nose - except you do that really fast: sniffing back snot - nose is "clear" once again (for the next few seconds / minutes). OT: as english is not my first language and this is in fact some complicated topic, I try to put it in as many words as possible. If I make a translation mistake (or typo ... which happen a lot to me) or can't find the proper words, it should be easier to figure that out or understand it at all from the overall context. BTW: I would appreciate it, if you could keep us updated on what actual medical proffesionals / doctors made out of this and advised in the end. I have tried a few sprays for my nose without much success. Those ones that you can only use for 3 days seem to clear it but I only use them when I am really stuffed up. The stuffiness seems worst in winter. I went back to the nasal pillows last night and cpap at 14. Results seem about the same . 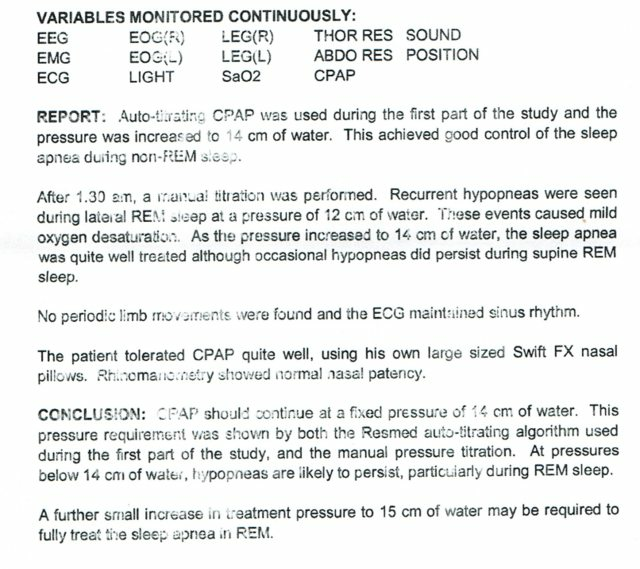 The sleep study was done 15 Jan 13. 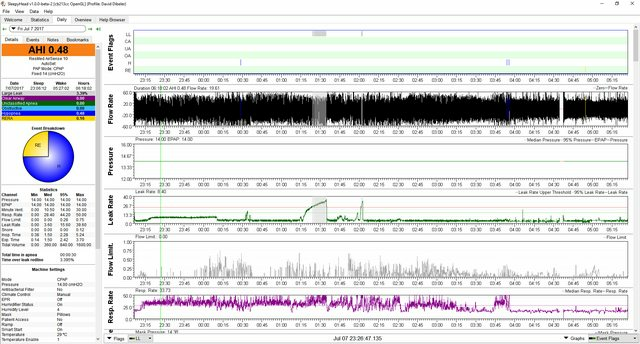 After looking at your previous SH charts and the one from above, I think I'd recommend you turn the EPR back on to address your Flow Limits. When you had it on, it looked like it eliminated, or greatly reduced, your Flow Limit and you Flow Rate pattern looked better as well. What you're actually saying is perhaps he should be evaluated for bilevel therapy. If indeed his respiration can be smoothed out by pressure support, a bilevel might be a solution. The suggestion to turn off EPR was based on the erratic respiration such that the machine could not switch from IPAP to EPAP with any predictability, but if ENOUGH pressure support could indeed stabilize inspiration/expiration then there might be a significant benefit. 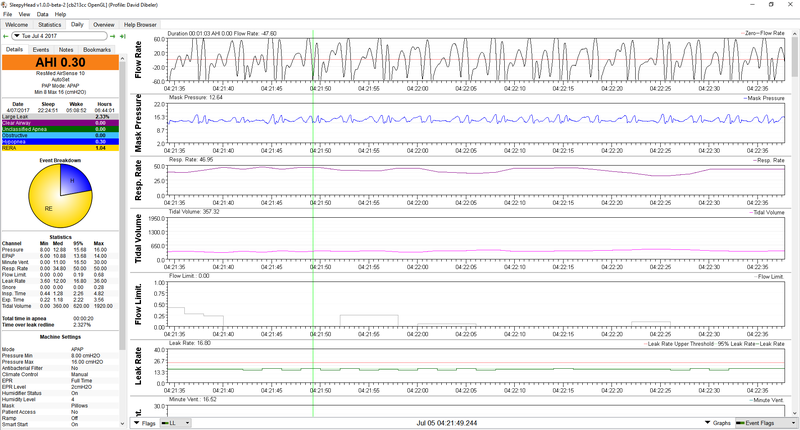 While the Autoset is limited to 3 cm EPR, I agree that experimenting with higher pressure support could be interesting. Sleeprider, you are correct. I'm currently on a laptop and having difficulty seeing some of the charts. The best that I can tell is a maximum EPR of 2 was attempted. What happens if he was to try setting it to 3? If he has, then I just couldn't see it.